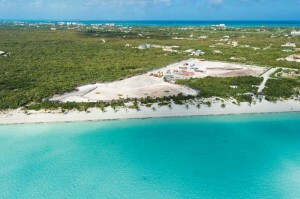 The Shore Club solidifies the importance of condo-resorts to TCI economy. Developer Stan Hartling is a firm believer in condo-resorts. To say that Stan Hartling is a firm believer in the value of condominium resorts is an understatement. The CEO of The Hartling Group has staked his reputation on this fact over the last two decades. 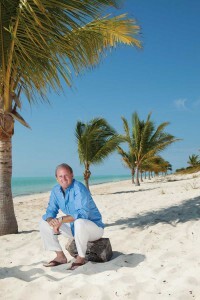 His first project in the Turks & Caicos, The Sands on Grace Bay, was among the original condominium resorts on the world-renowned stretch of beach when it opened in 1998. It was so successful that investors in his second project, The Palms (now known as Regent Palms) paid to be on the waiting list for prime suites prior to its opening in 2005. 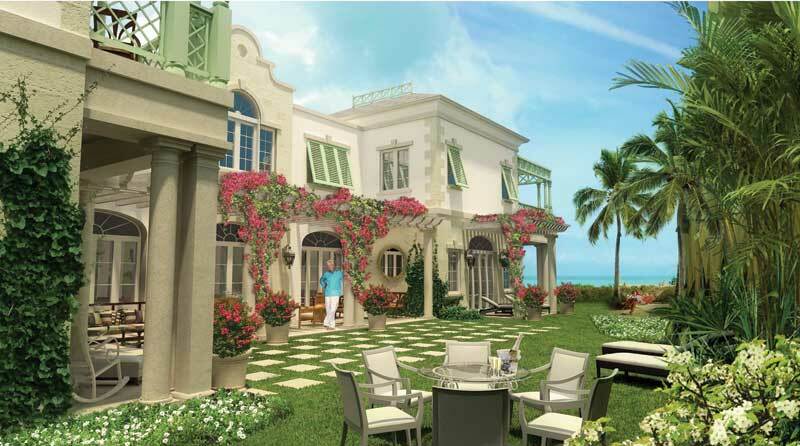 The Shore Club has 820 ft. of frontage on Long Bay Beach. The Shore Club sprawls over nine acres, with 820 feet of frontage along Long Bay Beach, the pencil-straight stretch that lines Provo’s remote southeastern elbow. Positioned at the secluded northern end of the beach, Shore Club residents and guests will likely meet only homeowners of the private estates nearby or the occasional kiteboarder plying the area’s steady breezes when they stroll the sweeping expanse of sand. From the initial approach along a paved, tree-lined road, the area is clearly low density residential, where natural vegetation and butterflies outnumber restaurants and rental cars. In fact, Hartling has stated that the location represents what is genuine and natural about the Caribbean, and chooses to keep it that way. The Shore Club’s exclusive estate villas include private garden courtyards. Architecture bears a Barbadian influence, designed to feel intimate in size and scale, steeped in Old World charm. Suites are available in five different designs tailored to buyers’ desires. Currently, he says, the TCI attracts loyal, affluent visitors who savor the country’s relaxed atmosphere, unique culture, welcoming population, and lack of fast-food outlets and retail franchises. Hartling says, “TCI is like ‘Caribbean Lite.’ It’s the kind of place where you can have an exotic experience, yet still feel comfortable and at home. There are no glaring stares or animosity.” This audience appreciates the condo-resort model, where spacious, well-cared-for suites with all the amenities allow them to settle in and enjoy the fabric of island life. In fact, nearly 50% of investors in Hartling Group properties are repeat owners, 25% owning multiple units. They visit often with family and friends and consider their purchase a family legacy. These folks are passionate about the TCI, contribute to the local economy, and tend to care more about community issues and laugh along with the charms of island living. This is typically NOT the case with branded hotel guests. Of course The Shore Club will provide all the amenities of a five-star resort, including three swimming pools, a wellness center and spa, restaurants and retail shops, tennis courts and watersports, and a facility for special events. Cayman-based construction management/services company DECCO joined The Shore Club project last fall following 1 1/2 years of due diligence. Hartling is proud that this solid, discerning company showed the confidence to be their strategic partner as they “test the TCI waters” for a planned expansion in the region. Although originally from Canada, Stan Hartling raised his family in the Turks & Caicos and his experience living “on the ground” nurtured another passion—that of breaking down the barriers between well meaning expatriate investors and Islanders. As the country’s second largest employer, Hartling puts action to words. For The Shore Club’s ground-breaking in January, 250 students from local high schools were invited, with the chance to meet motivational speaker and Jamaican Olympic gold medalist Sanya Richards-Ross. Hartling wanted the students to see development as a catapult into their future, not a barrier. With a myriad of employment opportunities open to the best and the brightest, and a scholarship fund available (The Shore Club recently contributed $35,000), the tourism industry can be their path to a successful future. Afterwards, the youth attended a career fair at The Regent Palms, where thirty island businesses unfolded an array of opportunities available right here at home. Besides thinking “outside the box,” one could accuse Hartling of “coloring outside the lines.” To date, the group has invested a stunning $1,000,000 in beach and road improvements, planting over 300 trees on either side to enhance the entrance to the community. These steps have improved the value of homes in the nearby Turks & Caicos Islander community, nurturing an expanded pride of place. Hartling’s hope for the future is that the neighborhood becomes fully integrated, with any and all buyers feeling welcome. With over 130 people now working on site (the majority are residents), The Shore Club construction is a breath of fresh air to the TCI economy, a reflection of renewed confidence. Hartling reports an immense response, with property trading at a 15% premium to Grace Bay and over 60% of the units sold. He sees this as a bellwether; that his clients are willing to pay for a carefully crafted, environmentally conscious, upscale development that is off the beaten path.